There’s nothing quite like hundreds of twinkling lights on evergreen trees to put us in the holiday mood in December. Unfortunately, safety risks come along with holiday decorations. Don’t let a trip to the emergency room or a call to the fire station ruin your holiday this year. Follow these safety tips for holiday decorating to help your holidays go smoothly. Artificial trees are the safest, but make sure you see the tag that says fire-resistant. Many people still prefer a real tree because of the tradition of picking one out. Real trees can be safe as long as you pick a fresh one. A fresh tree will have needles that are hard to pull off the branches and the end of the trunk will be sticky from resin. If needles fall when you shake it, find a different tree. Keeping the tree fresh is one of the most important safety tips for holiday decorating. Once you get it home, cut a few inches off the trunk so that it will absorb water better. Fill the tree stand with water and keep it that way. Don’t place a real tree near the fireplace or other heating sources. Keep in mind that a dry tree combined with a spark, damaged electrical wire, or too much heat can be a fire risk. Check strings of lights for frayed wires and cracked sockets and replace them if you find damage. Don’t attach more than three standard-sized strands of lights together on an extension cord. Because it’s possible for lights to short and cause a fire, don’t leave the lights on overnight and always turn them off before leaving home. Remember safety tips for holiday decorating outdoors, too. For decorating with lights or any wired decorations check the labels and follow the wattage levels. 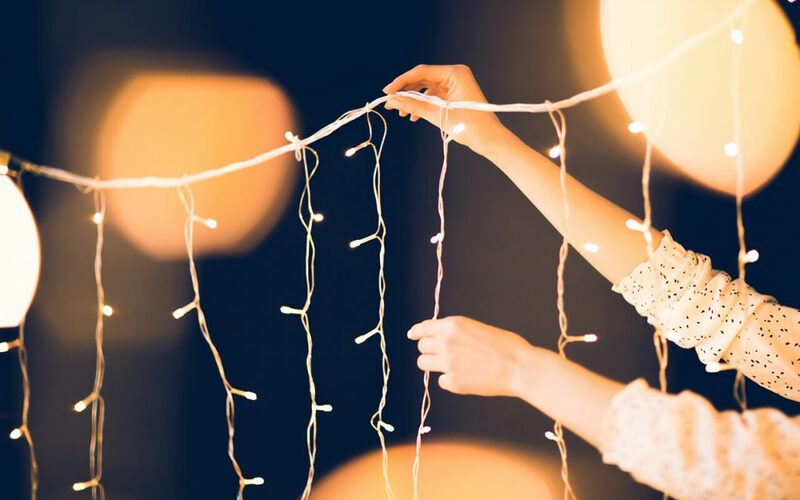 When using outdoor lights, make sure you plug them into a ground fault circuit interrupter (GFCI) outlet so that it will shut down in case of a circuit overload. Don’t have one? You can buy a portable outdoor unit at a hardware store. Put all outdoor lights on a timer so they will also turn off before bedtime. If you hang decorations on your house, use a ladder that extends three feet higher than the roof. Place the ladder on firm and level ground and make sure it can support your weight and the weight of the decorations. Don’t place ladders near power lines or doors and wear shoes with non-slip soles. Inflatable snowmen and other holiday characters are popular for outdoor decorating. Secure them according to instructions so that they won’t become dangerous projectiles. Shut off the fan blowers during high winds, before you go to bed, and before leaving home. Happy Holidays from Blueprint Home Inspections!